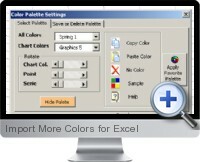 Customize and save your own Color Palettes with the colors of your business or customers. Clarify or intensify the color of the cell backgrounds. Zoom to fit your selection with the screen. Display or hide grid lines, and more. Give format, order, easy visualization and facilitate the development of reports or models that are easy to read, impressive and professionally presented.